Adapted from Lady Bird Johnson. 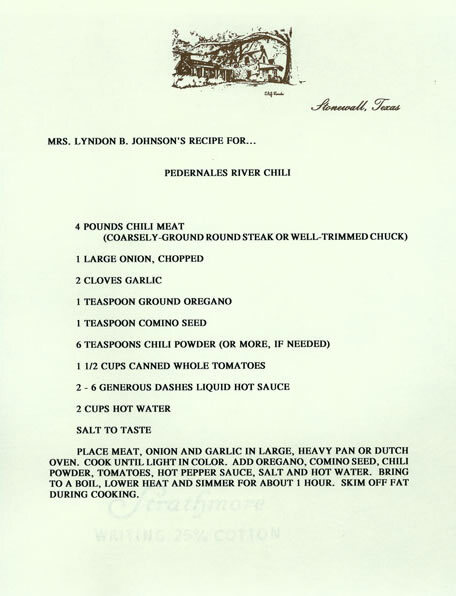 This chili recipe was so requested that Mrs. Johnson had it printed on cards suitable for mailing. Cook the meat, onion and garlic in a Dutch oven over medium heat, stirring, until lightly browned. Stir in the oregano, cumin, chile powder, tomatoes, hot sauce, salt and 2 cups hot water. Bring to a boil, lower heat and simmer, covered, for about 1 hour, skimming off the fat as it cooks.